When I was growing up, we were fortunate to live near my Aunt Mary and Uncle John's family. Aunt Mary and Uncle John had ten children and our family had five children. We celebrated many birthdays together; we also played countless games of flashlight tag together. During the game, one could hear "One, two, three I see Joni" or "Olley olley umphrey all home free." Those of us hiding would taunt the person on goal with noises or calls of "hootie - whoo." 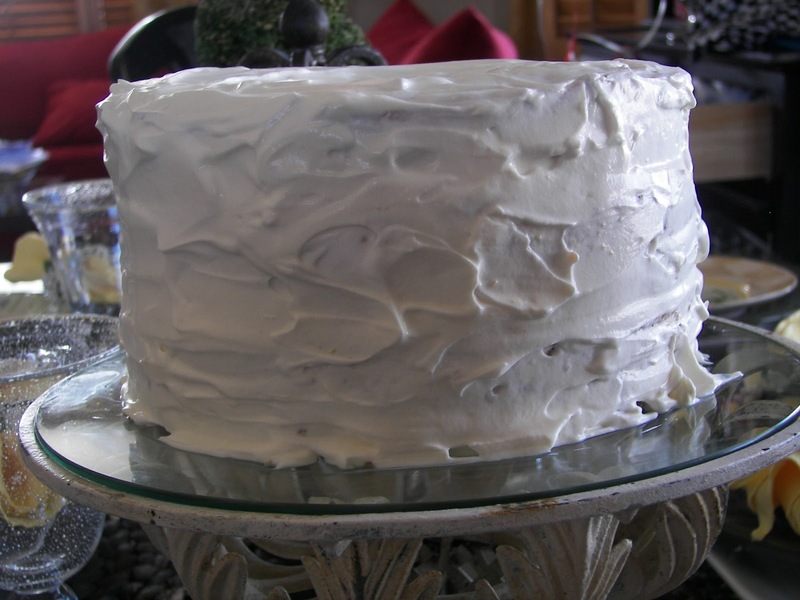 When we went to Aunt Mary's home (Uncle John died when I was very young), it seemed to me that we would always have a three layer birthday cake. I always loved it. Later in life I talked to Jacqueline about Aunt Mary's cake, and she said it was just a three layer cake with whispped cream and bananas. I have made my version of "Aunt Mary's Birthday Cake" a couple of times for my family and we love it. Aunt Mary's cake definitely didn't have a two cream frosting, but this frosting works so well with this cake. Aunt Mary's Cake makes an impressive party cake. 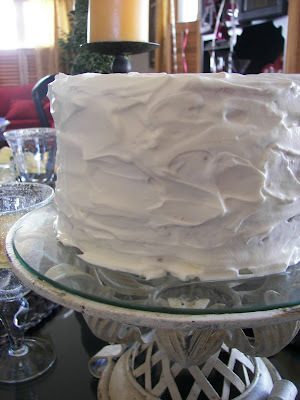 For the white cake, this time I used a recipe from a Better Homes and Garden's magazine -- it was a delicious, moist white cake! Aunt Mary always colored her layers: white, pink, and green. This photo provides a better shot of the bananas peeking out. You will need three layers of white cake, 2-3 bananas, and a batch of Two Cream frosting. The secret is to make sure you don't over bake your cake. Take the layers out a minute or so before you "think" they are done. Separate eggs. Allow egg whites to stand at room temperature for 30 minutes (reserve yolks for another use). Meanwhile, grease three 8 x 1-/2 -inch round cake pans. Line bottoms of pans with parchment paper. Grease parchment paper and lightly flour pans; set aside. In medium bowl stir together flour, baking powder, baking soda, and salt; set aside. Preheat oven to 350 degrees. In large mixing bowl, beat butter with electric mixer on medium to high speed for 30 seconds. Add sugar and vanilla; beat until well combined. Add egg whites all at once; beat on medium-high for 3 minutes. Alternately add flour mixture and buttermilk to butter mixture, beating on low after each addition just until combined. Divide batter into prepared pans. Bake in preheated oven 30 to 35 minutes or until a wooden toothpick or skewer inserted near centers comes out clean. Cool cakes in pans on wire racks for 10 minutes. Remove layers from pans. Cool thoroughly on racks. Whip cream in a medium bowl and then gradually add the sugar. Fold in sour cream. Place one layer of cake on cake stand; frost top of cake and add sliced bananas. Place second layer on top of first and frost top of cake and add sliced bananas. Place third layer on top of second layer then frost all layers of cake. For stability, you may wish to insert three to four thin wooden dowels or skewer. Refrigerate cake two hours before serving. This will allow the frosting to harden. The cake also tastes marvelous the next day. Because of the cream, any leftovers must be refrigerated. This sounds so good, and my husband's birthday is the 29th (leap year baby). I am going to make it this week! Thank you. Love the story of your family's celebrations - 15 kids, that's alot!! That looks amazing! When I saw the cake in your tablescape yesterday, I was hoping you would share the recipe! All I can say is Mmmmmmmmmmmmmmmmmmmmmmmmmmm! 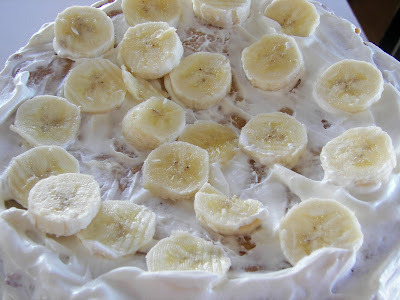 I love whipped cream and bananas together, so I know this would be a fabulous cake! Isn't it nice to be able to recreate such a fond childhood memory? Beautiful cake and it looks DELICIOUS! I will bookmark this one. Aunt Mary's cake and traditions sound so special. I bet your kids will continue it on. 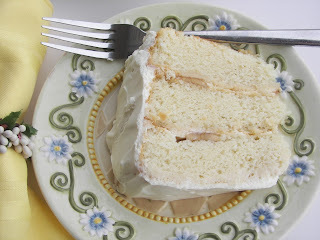 My mother-in-law always made the best and prettiest homemade caramel cake. I tried many times and it is hard to get right. She gave my daughter and I a lesson this Christmas on her tricks to get the icing just right. The trouble is you forget from Christmas to next Christmas. Joni, this looks fabulous! 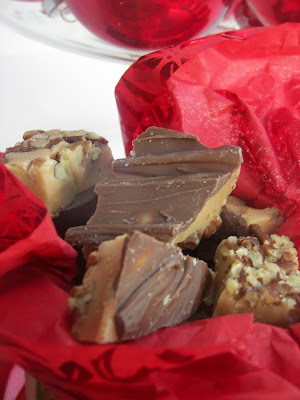 I can't tell you how thrilled I am when you share these family recipes that are priceless. I can't wait to try this at our next celebration! What a pretty cake, and looks delicious too. 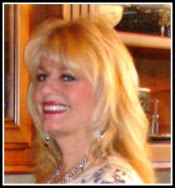 I'd love a spot at your table to try some of your Red Couch Recipes - what a fabulous cook you are, Joni! Thanks so much for sponsoring the CSN giveaway. I am very blessed to have won. I believe I will be adding china to my collection - I'll post photos when received! Thanks again! Oh, this cake looks so good! I am going to have to make this really soon. I have spent so much time in the kitchen that my hubby is getting a bit chubby! He's not complaining though! I made your lemon chicken and it was a hit! Everyone loved it! That cake is so mouthwatering! I have two nine inch cake pans that were my grandmothers and just found a third one at goodwill. Fate? I think so! We used to play tag in the dark in the cornstalks (very dangerous to anyone who has ever been in the cornstalks). I can remember Olly Olly in Free - but I wish we had the Hootie Who! Oh, my word! That sounds so wonderful. oh yum! looks and sounds delicious-i could so go for a piece right now! thanks for sharing your recipe! Um yes please!! That looks and sound absolutely delicious! 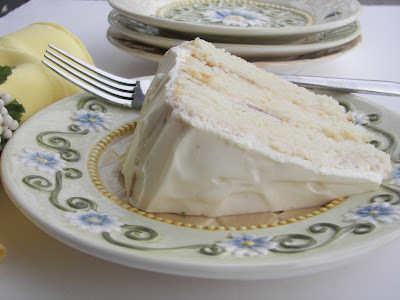 My husband loves banana desserts so this would be a perfect birthday cake for him. I want this for my birthday cake! What a treat it must have been for you to be served a slice of that colorful cake. Thanks for sharing this family recipe. Looks so yummy. I remember her cakes. I thought the pink and green layers were the prettiest things I had ever seen. Glad to be back! At first it was telling me you were not even here anymore. So glad I was able to find you. This cake looks marvelous, and your tablescape is so fresh. That cake! And such pretty plates, too. Where did you get them??? wow very tasty food your idea is very attractive.